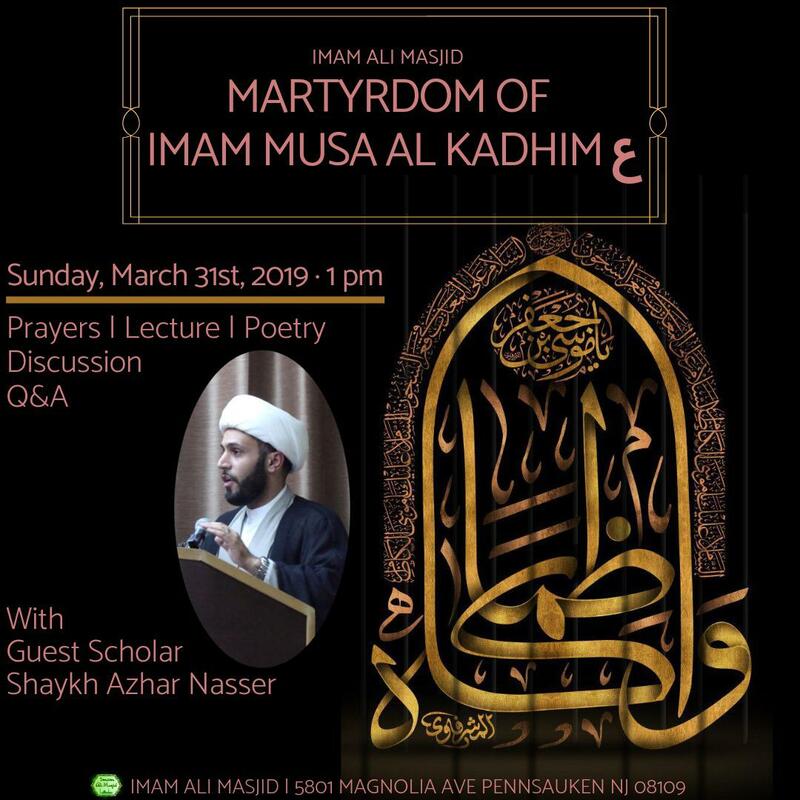 Join us on Sunday, March 31st to commemorate the martyrdom of Imam Musa al Kadhim (AS). 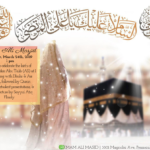 The program will begin at 1 pm with Dhuhr and Asr prayers followed by lecture with Guest Scholar Shaykh Azhar Nasser. There will also be recitation of poetry and a discussion with Q&A afterwards. View the attached flyer for more information. Join us on Sunday March 24th to celebrate the birth of Imam Ali ibn Ibn Talib (AS). 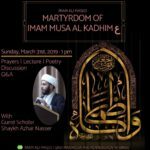 The program will begin with Dhuhr & Asr prayers (1:00 pm), followed by recitation of Quran, student presentations, poetry, and English lecture with Sayyid Atiq Ebady. View the flyer below for more information. The Moon-Sighting Committee in the Council of Shia Muslim Scholars of North America announces that Friday, March 8th, 2019 will be the first day of the month of Rajab 1440AH for the entire region of North America. 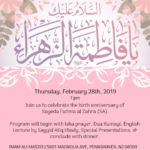 Join us to celebrate the birth of Sayeda Fatima al Zahra (SA) on Thursday, February 28th at 7pm. 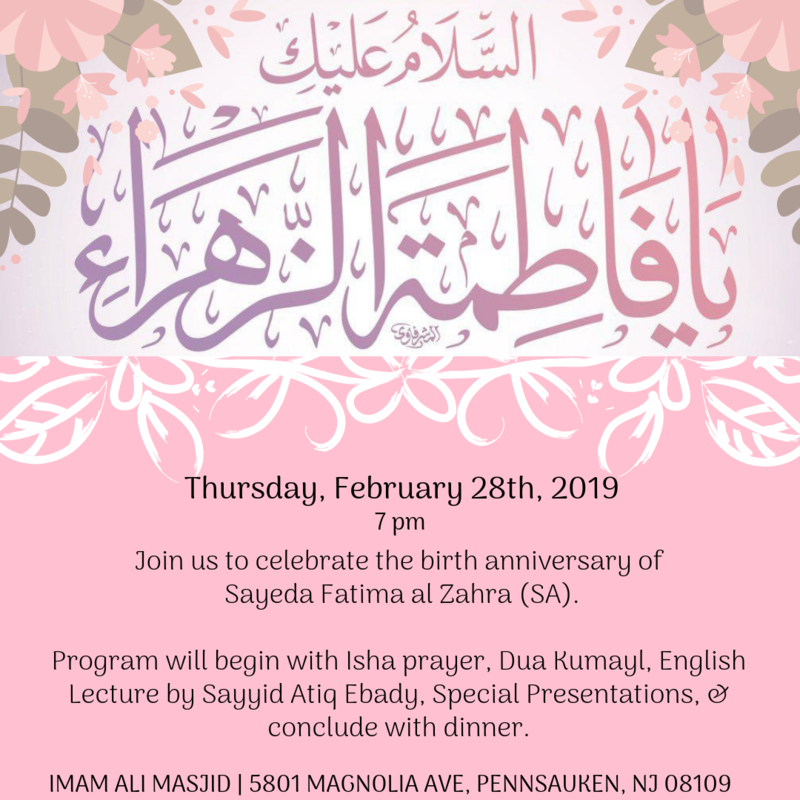 The program will begin with Isha prayers, Dua Kumayl, English lecture by Sayyid Atiq Ebady, special presentations, and conclude with dinner. See the attached flyer for more information. 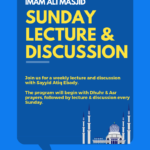 Join us for a weekly Sunday lecture and discussion with Sayyid Atiq Ebady. 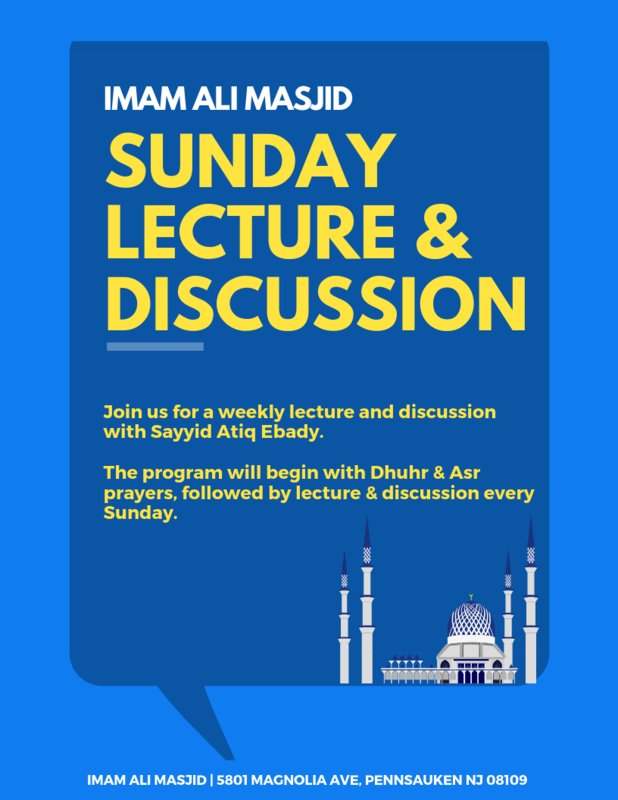 The program will be every Sunday starting with Dhuhr and Asr prayers, followed by lecture and discussion. All are welcome to attend.